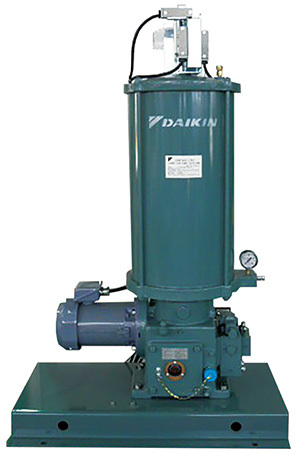 U (Motor Driven Grease Pump) | Products | Daikin Lubrication Products & Engineering Co., Ltd. This motor driven grease pump is used in dual line systems. It supports larger mechanical equipments and faster speeds to aid the streamlining of facilities. The pipe diameter can be made narrow due to application of higher pump pressure, which helps to save piping costs. The pump has a built-in reduction gear and is directly coupled to an electric motor. As a result, this pump is compact and has a small footprint. Lubrication pressure can be further assured by higher pressure, which ensures that grease can be fed reliably to the end of the supply line. The supply line can be extended proportionately to the lubrication pressure. Consequently, lubrication is possible over a wider (longer) range. Automatic operation is possible easily and at low cost by installing an electric control panel (exclusive standard part). Note) 1. When the tank oil amount is automatically controlled, the actual tank capacity decreases by approximately 15%. 2. Continuous rating is applied for the electric motor. Note, however, that the U-45 type is a 10-minute rating.